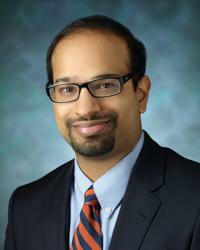 Ajay Kadakkal, MD, is a board-certified advanced heart failure specialist at MedStar Washington Hospital Center’s Heart and Vascular Institute. He treats patients with advanced diastolic heart failure and congestive heart failure. He also treats patients who are in need of a heart transplant and require mechanical service support from devices like the left ventricular assist device (LVAD). In addition, Dr. Kadakkal takes a special interest in infiltrative and inflammatory heart conditions like cardiac amyloidosis and sarcoidosis, which are often underdiagnosed. He is dedicated to building MedStar Heart and Vascular Institute as a referral base and top local center for referrals for patients with these conditions. Dr. Kadakkal is part of a strong clinical practice at Medstar that provides a variety of diagnostic tests, ranging from imaging to cardiac stress testing. As part of this practice, he contributes to a team that is at the forefront of LVAD device placement and management at one of the top LVAD implant centers in the country. Dr. Kadakkal is passionate about continuing to develop and improve the durability and size of LVADs. His goal is to contribute to clinical trials that will improve the design of LVADs to be fully implantable, smaller, and less intrusive to the patient’s quality of life. He is part of a group research effort at MedStar Heart and Vascular Institute that involves a variety of clinical trials currently researching and providing new technology to patients who require mechanical circulatory support. His team is also currently building a database that observes patients with sarcoidosis and amyloidosis, looking at the difference in hemodynamic parameters among specific treatments for these conditions. Dr. Kadakkal received his medical degree from the University of Virginia School of Medicine. He then joined University of Pittsburgh Medical Center for residency and fellowship training before completing a specialty fellowship at Stanford University Medical Center. “Today, cardiovascular care is heavily influenced by technology. For this reason, it’s important that I am able to offer my patients the most advanced technology available while adhering to evidence-based practices. “I take the time to help each patient understand the process of his/her disease and clearly understand what treatment options are available to either improve his/her health or stay within the lines of what his/her goals of care are. I believe that a holistic approach to patient care provides the best results. The ability to provide compassionate care lies in the time I take to listen to my patients in order to provide them with the best quality of life and survival available to them by implementing what I feel is the newest and most advanced technology.